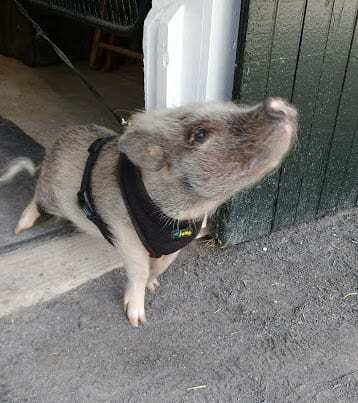 Last summer, we brought you the story of Pierre the miniature pig, one of the most popular four-legged creatures on the Fasig-Tipton Saratoga grounds. Pierre, who belongs to Summerfield Sales employee Jennifer Given, was back in town for this year's auction, but this time he found himself sharing the spotlight. There's a new mini pig in town. This year, Given also brought Pork Chop, a distant cousin to Pierre, along for the trip from her Morriston, Fla. base. It's fair to say Pierre was less than thrilled. Pork Chop is eight months old, about the same age Pierre was at his first Saratoga sale and at just a few inches high, is almost full-grown. Like any Saratoga first-timer, he spent this week adjusting to the sensory overload that is the sales grounds ahead of a select yearling auction. On Sunday afternoon, Pork Chop seemed little more than a myth, as he spent a good part of the day in a tack room under a horse blanket, finding the stream of passersby a little overwhelming. By Monday morning, he had embraced his job as Summerfield greeter. Given stays in communication with Pierre's breeder and has had many inquiries about mini pigs since she began bringing Pierre to sales with Summerfield's consignments in New York and Kentucky. The breeder asked if any of her Thoroughbred connections might be interested in purchasing their own pig, and so Given brought Pork Chop along. Pork Chop goes back and forth to the farm with Given, riding in a little soft-sided mesh crate made to transport small dogs. Once on the property, he coexists with the horses while Given works, keeping out of their way but paying them little attention. The Thoroughbreds at Summerfield are likewise unconcerned, though Given said a couple of them were initially confused by the noises he makes. Although he's equally docile, Pork Chop is a little different from his well-known cousin, Pierre. He's much more vocal, oinking or grunting with every step around the tack room, where he spent afternoons cleaning alfalfa hay strands off the floor. He's also a little pickier about his food, having demonstrated a disgust for tomatoes. “He's a chatty guy,” she said. “And his eyes are really different than Pierre's; they're more human. Pierre has spent the year since we last wrote about him learning the life of a sales pig. During times with a lot of foot traffic, he stays on a harness and leash in a tack room (a different tack room from rival Pork Chop), but when things quiet down he moves to a safe area outside the barn where he enjoys napping in the sunshine. Pierre doesn't likely know it yet, but his spotlight is safe. Within a few days of his arrival to Saratoga, Pork Chop found a new home — breeder Walt Borisenok bought Pork Chop for his wife Michelle as a birthday gift. Once the sale is over, Pork Chop will transfer to Old Tavern Farm, where he will surely be the star of the show. Given plans to check in on him next summer. 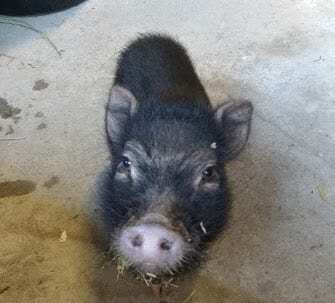 This entry was posted in Barn Buddies, Horse Care, NL List and tagged barn buddies, barn pigs, fasig-tipton, fasig-tipton saratoga sale, mini pigs, saratoga, summerfield sales agency by Natalie Voss. Bookmark the permalink.